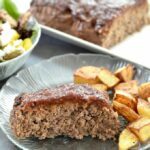 This Gluten-Free, Paleo Meatloaf is the perfect family dinner. Make it ahead of time and reheat on a busy night. In a small bowl, mix together almond flour, coconut flour, garlic powder, onion powder salt & pepper. Set aside. In a large bowl mix together ground beef, egg, Worcestershire sauce, milk of choice & BBQ sauce until combined. Add dry ingredients to meat mixture and stir well until completely combined. Put your mixture into your prepared baking pan. Bake at 350oF for 45-65 minutes (time varies depending on the thickness of your loaf).